WASHINGTON (Oct. 16, 2017) —Three astrophysicists from the George Washington University are part of a global group of scientists who collaborated on identification and study of the first confirmed observation of two merging neutron stars, a so-called kilonova. 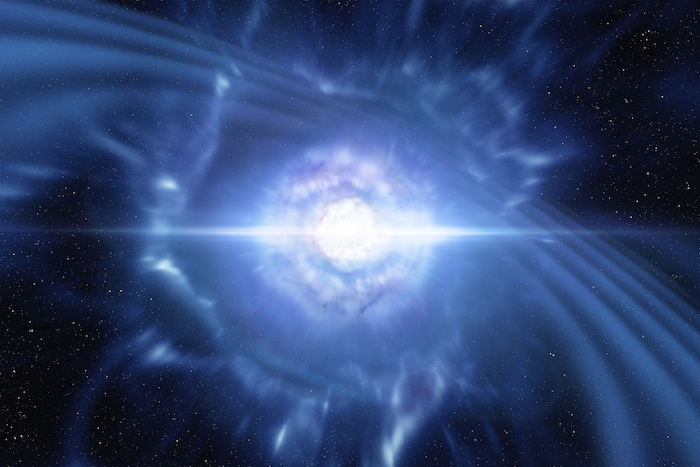 The existence of a kilonova—an explosive event roughly 1,000 times brighter than a nova—had long been suggested but was never definitively witnessed until now. The merger of two neutron stars was predicted to generate both gravitational waves and emit electromagnetic radiation at various wavelengths. Researchers also suspected that these mergers are the source of mysterious short gamma-ray bursts. The recent observations confirmed those predictions. On Aug. 17, the Advanced Laser Interferometer Gravitational-Wave Observatory (LIGO) in the United States and the Advanced Virgo Interferometer in Italy alerted scientists to a gravitational wave event. Two orbiting space observatories, the European Space Agency’s INTErnational Gamma Ray Astrophysics Laboratory (INTEGRAL) and NASA’s Fermi Gamma-ray Space Telescope detected a short gamma-ray burst coming from the same area of the sky as the gravitational wave event. In the days following the initial detection, scientists aimed their instruments at the object, located some 130 million light-years away in the constellation Hydra. The effort included the European Southern Observatory’s telescopes in Chile, Gemini South and the Cerro Tololo Inter-American Observatory (CTIO) and others, which detected the light from this gravitational wave event. Together these observations confirm that a kilonova had, in fact, been detected. Gamma-ray bursts are the most powerful, brightest explosions in the universe. These short, transient events can last a few seconds or minutes, providing information about the formation and expansion of our universe. Dr. Kouveliotou, a leading expert on gamma ray bursts, worked closely with the research group led by Elena Pian of Istituto Nazionale di Astrofisica in Italy to study the optical and infrared electromagnetic radiation emitted from the merger. Each element in the universe emits a unique spectrum, so this data can help researchers determine how and where rare elements on Earth originate. The work published in Nature by Dr. Pian, Dr. Kouveliotou and others, confirms that neutron-star mergers are major cosmic production sites of heavy elements such as gold, platinum and lanthanides. Other members of the GW Astrophysics group studied different aspects of the kilonova. Alexander van der Horst, an assistant professor of physics in CCAS, and Dr. Kouveliotou co-authored a paper that examined the polarimetry of the light emitted by the neutron-star merger. By studying the light emitted by the event in this way, scientists are learning more about how the light is produced. Dr. van der Horst is also leading the science team working on OCTOCAM, a new instrument being built at the Gemini South Observatory that will allow researchers to do in-depth studies on objects of interest such as kilonovae once they are detected. OCTOCAM is scheduled for completion by the end of 2021. Bethany Cobb Kung, an associate professor of honors and physics in GW’s Columbian College of Arts and Sciences, used a telescope at CTIO to observe the infrared glow from the kilonova over a course of 10 nights. Dr. Cobb Kung was a part of a team of astronomers led by California Institute of Technology’s Mansi Kasliwal. The team along with another led by Harvard University’s Edo Berger studied the composition of the material released by the merging of the two stars, further confirming that a kilonova had been witnessed. Drs. Cobb Kung, Kouveliotou and van der Horst are also among the authors of another paper published in Astrophysical Journal, which describes in detail the timeline of this discovery. These three GW astrophysicists plan to continue to study gravitational wave astrophysics in a new era that has started with this extraordinary event. Nature Astronomy: "The Unpolarized Macronova Associated with the Gravitational Wave Event GW170817"
Science: "Illuminating Gravitational Waves: A Concordant Picture of Photons from a Neutron Star Merger"
Astrophysical Journal: "Multi-Messenger Observations of a Binary Neutron Star Merger"